Many people with eye ailments are opting for eye surgery to correct their problems. It is important for patients to know the risks involved before proceeding with it by knowing the advantages and disadvantages of the surgery. Personal research is recommended for anybody considering having eye surgery. Eye surgery has numerous benefits thus making it popular for people opting to correct vision problems. However, people who are considering eye surgery should be aware of the following risks and benefits associated with the procedure. The advantages of eye surgery are evident not only after the procedure, but also during the process of the surgery. The advantages vary from one different procedure to the other as there are different types of eye surgery. The patient should be at liberty to choose the most suitable procedure and a skilled and knowledgeable surgeon. Some types of laser eye surgeries, for example, have minimal risks and with the help of a skilled surgeon, it is possible to reduce them further. Proper eye surgeons should have the ability to diagnose the problem accurately and explain the risks involved in the procedure. This ensures that during eye surgery, the risks are reduced, as well as those following the procedure. All types of laser eye surgery should be minimally invasive with minimal pain or discomfort. They ensure faster recovery for the patient compared with other types of eye surgery. Another advantage is that the patient is able to report any case of discomfort experienced after or during the procedure. If the procedure is a success, the patient is able to leave the dependency of glasses and contact lenses. This is a big advantage to the patient since it gives the person relief from the constant renewing of vision aid. In the event that it is more than 50% successful, the patient still appreciates wearing less bulky vision aid. The most pronounced disadvantage of eye surgery is the possibility of complications and risks involved in the procedure. The risks involved vary from one procedure to the other although they are minimal most of the time. The most feared effect is the halo and glare side effects of eye surgery. Dry eyes can also be a result of poorly executed eye surgery. Some patients fear the regression that might occur sometime after the surgery. Another disadvantage is that it is not open for just anybody. Some procedures like LASIK cannot be used in the case of all patients since it is important for the person to have a cornea thickness of the right size. Younger people have more odds of going through with eye surgery than older people do. In cases where the patient has a medical condition that put him at risk of having laser eye surgery, it is advisable for him not to subject himself to it. 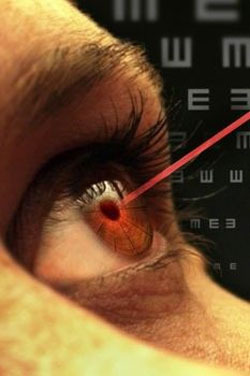 Laser eye surgery is costly thus eliminating many patients who would like to have it but cannot afford it. The better options have more advanced technology thus making them costly and the insurance covers do not include them in their packages.